Product #18301 | SKU DUO-150 | 0.0 (no ratings yet) Thanks for your rating! Features; 2 x D-Tap and 1 x USB power out connector. 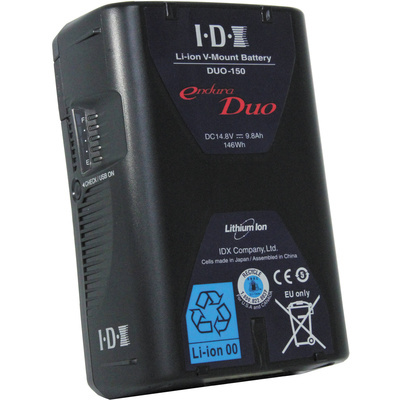 The 146Wh DUO 150 V-Mount Li-Ion Battery from IDX is equipped with 2 x D-Tap and 1 x USB power out connector for powering peripheral equipment. This Li-Ion battery is designed for the Digital Cinematography market where high current loads of 10A/120W are standard. The DUO-150’s high capacity of 146Wh gives extended running times, while being under the 160Wh IATA limit for carry-on aircraft baggage.